Debbie Doles, Kristen Scaletta and I landed in Las Vegas on a warm, sunny afternoon, which was a welcome change from recently-turned-cold Chicago. We rented our car and soon left the bright lights and big dreams of Vegas behind as we headed into the dusty red mountains and desert that led us to St. George, Utah. We were on our way to gather footage for the ENF’s soon-to-be released short feature film, Giving Back. For the past three years, St. George ‘Dixie’, Utah, Lodge No. 1743 has used an Impact Grant to run the Pantry Partners for Success project at Millcreek High, a local alternative high school. The Lodge provides material and other support to the students at the school. It’s a wildly successful project, and has both raised the graduation rate at the school and raised the Lodge’s image in the community. Because of this, we chose to feature this project as part of the ENF video, and were headed to get footage of Elks in action. Bibb frames a shot of the pantry. With Debbie at the wheel, me navigating, and Kristen Scaletta in the back seat, we cruised through Nevada, briefly sped through Arizona, and finally sailed into Utah. Halfway through the trip, our fearless film director Judson Bibb called to say he was already in town and headed over to the filming site to start planning for the big shoot the next day. Fame waits for no one, I guess. As we were still quite a way from St. George, literally battling the desert tumbleweed, we called in our local troops and they met Bibb at Millcreek High School to show him around. Betty and Heidi to the rescue! It was a sign of things to come. Betty Archambault and Heidi Tasso would be a tremendous help to us the next few days, and we were grateful for their time and expertise. Once the school and Lodge sites were scoped out for filming, we headed to a business dinner along with the director. We laid out a schedule, discussing lighting, plans, and lighting again. As it turns out, lighting is pretty important when filming. (Apparently our collective inner light just wasn’t enough.) Armed with our newfound industry knowledge, we went to sleep dreaming of Hollywood, which would surely be clamoring to make us stars once they saw our finished film. Though tempted, we did not abandon the ENF for the siren song of stardom. We awoke early the next day, and armed with coffee and tea, headed back to high school (dun dun duuuuun). The film crew, fresh in from Las Vegas that morning, was already at Millcreek preparing the equipment. We soon learned that the cameraman and sound technician’s regular jobs were to film a reality show about pawn shops in Vegas, so they must have been looking forward to filming something truly exciting—the ENF video. the daily shipment of food and other supplies. ﻿﻿﻿﻿﻿﻿A basically wonderful crew of Elks came down to the school that day to help out. Wayne, Joe, Betty, Terry, Heidi, Jackie and more volunteers helped with delivering supplies, packing shelves and speaking with students. Many even agreed to be interviewed for the video. There was a buzz at the school that day, as all students were aware of the film crew and had signed releases to be filmed. The film crew visited the nursery, where young children slept, played and ate while their parents worked toward their high school degrees. Many students stopped in the nursery throughout the day, visiting with the children and helping to care for them. There was even a preschool section for one child who was ready to start attending school himself. The film crew rolled the tape as a truck from a local food pantry rolled up, filled with supplies and food for the students. Elks lined up to carry items into the pantry, and students lent a hand with some of the heavy lifting. Supplies ranged from fresh produce to baby food to a bed for a student who’d been sleeping on the floor before the Elks intervened. 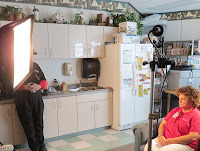 As the day moved on and interview after interview wrapped, we began to see what goes into a day’s worth of managing the Pantry Partners for Success project. A local quilting group quietly dropped off more than a dozen beautiful handmade quilts for the students. The Lodge’s Exalted Ruler casually dropped off two hand-carved cradles for the young children in the nursery, with their names inscribed on the side. The filing cabinets in the nursery were stocked not with paper, but with formula, diapers, knitted hats, boots and clothes for the children. The preschool section of the nursery was lined with books and toys. 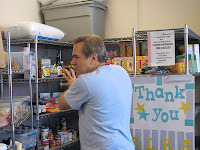 The pantry had everything from quick meals to prepare at home, to pans to cook those meals, to bus passes, shoes and bedding. At the end of the school day, the tables in the front hall were stocked with the pantry supplies and the students took what they needed for dinner, breakfast and for their family members. We then headed to the Lodge for a few final interviews. As twilight approached, there’s no better place to be than outside on the porch at St. George Lodge. The view of the town and mountains is breathtaking, and it served as the backdrop for a few of our interviews. Lodge members stepped up to tell us what being an Elk means to them, and what programs they are most proud of. As the last rays of sunlight faded away, we called it a wrap and headed inside for dinner. This vegetarian had a great time at steak night, amidst great company and tales of local lore. We even learned about the resident ghost, though he didn’t show his face that night. Will it be possible for individual lodges to add this to their web sites? Can a lodge get the dvd burned via your site? The ENF plans to send a DVD copy of the video to every Lodge by February. We will also post the video online, so Lodges can link to it from there. We hope you enjoyed it! Can't wait to receive the DVD. We plan to show the DVD to our new members at their orientation.